While our Kentucky seasons are not the most extreme in the USA, they sometimes exhibit some fairly extreme weather conditions. From wind and rain to hail and more, external conditions can have a major impact on your home’s roof. While roofing repairs are a common service across our nation, the complexity and skills needed to safely and correctly make repairs means that this task is usually one best reserved for the professionals. HCI Roofing and Construction understands that your house’s roofing is the most important part of your home, as it protects all of your loved ones and valuables. As Louisville’s go-to roofing contractors, we’re trained and certified to offer a comprehensive set of services to optimize your home’s defense against the elements. Hiring a professional roofing company can spell the difference between an amazing outcome and a logistical nightmare. 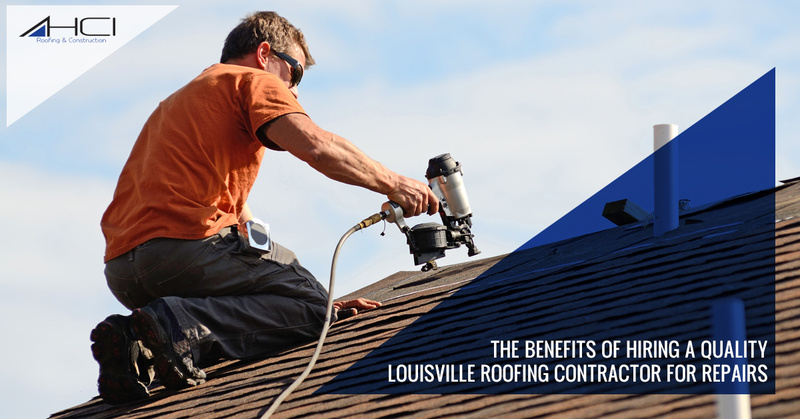 Today, we’ll look at a few benefits that you can expect from working with our quality Louisville roofing contractors. When you’re ready, feel free to contact us to receive a quote on your project! The nature of roofing repairs and installation is inherently dangerous. Hiring an incompetent roofing company or doing the job yourself can result in serious injuries or worse. Our experienced roofers have the training and equipment needed to create the safest outcome for everyone involved. Don’t risk your property or loved ones; call the pros! Quality roofing contractors can procure the best materials at better prices to produce a better outcome for your home’s roofing. While saving money may be your main goal in avoiding top-notch roofers, the truth is that our technicians will be able to procure the best goods and utilize the best tools to get everything done in a much more efficient manner. With less time needed and less resources wasted, you’re receiving a lot more bang for your buck when you invest in professionals like HCI Roofing. While you or an amateur roofing company can repair the area in question, the question remains as to whether or not you fixed the root issue. Our professionals are here to get the job done correctly, rectifying problems now in a manner that provides years of quality service. With proven techniques and training, each roofing contractor on our staff is able to complete everything in its entirety. Repairing or replacing your roof is a major investment, and it should be insured to ensure the best outcome. Even if you complete your roofing repairs perfectly, the chance remains for something to go awry in the near future. Receiving a comprehensive warranty is one surefire way to protect your new investment, and it pays to go with a roofing company that stands behind their work. If something goes wrong due to our craftsmanship, you’ll receive fast, free repairs to keep everyone happy. Hiring a quality roofing contractor in Kentucky can prove to be a very smart investment in your home. While many people have an aversion to the cost, it oftentimes proves to be much more economical to go with the professionals for nearly every service. Our dedication to customer satisfaction helps to make us your Top Rated Local® Louisville roofing experts. Contact us today to learn more or to schedule your quote!